Weekly Shonen Jump features Olympus and Twilight Town in KH3! 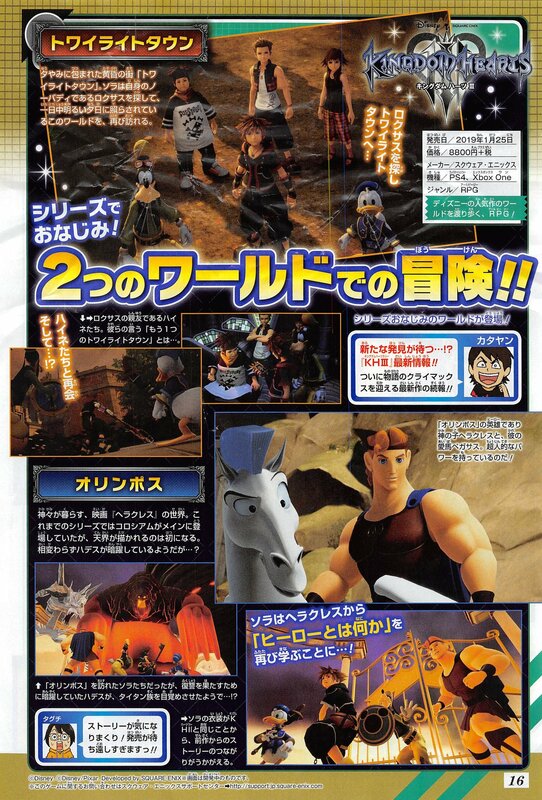 Yesterday V-Jump gave fans their first look at the new models for Hercules, Hades, Megara, and Zeus, and today the latest issue of Weekly Shonen Jump features a bit of information about the stories of Olympus and Twilight Town in Kingdom Hearts III. Twilight Town, a city bathed in the evening dusk. Sora searches for his Nobody, Roxas, in a world that is forever illuminated by a bright sunset. A reunion with Hayner and friends, then...what!? Hayner and his friends are Roxas' best friends. What will they say about there being another Twilight Town? Sora learns again from Hercules what it means to be a hero! Hercules, a movie based in a world where the gods live. The Coliseum has appeared in the series before, but this is the first time the home of the gods will be shown. As usual, Hades seems to be up to something...but what? Sora and his friends visit Olympus, and there they discover that Hades has been secretly plotting to get his revenge by awakening the Titans! Hercules, the hero of Olympus and son of a god, is joined with his beloved friend Pegasus. Sora’s costume is the same from Kingdom Hearts II, connecting this story to the previous game. Follow Kingdom Hearts Insider on Facebook, and Twitter for the latest updates on Kingdom Hearts Union χ [Cross], Kingdom Hearts 3 and all things Kingdom Hearts! I absolutely love Pegasus' expression in that one panel. I am loving these reveals and magazine updates! BRING ON MORE WORLDS PLS!! The trailers have been implying that the digital Twilight Town is possibly the solution to bringing Roxas back, so it is fair to say they are "looking" for him. Wish we got a better shot of Zeus though because he looks a bit off. His hair color for one is white when it should look more beige. Iâ€™m just curious as to what will go wrong when they enter Data Twilight Town to find Roxas since it doesnâ€™t seem like heâ€™s been brought back yet when Sora is in San Fransokyo, which seems to take place much later in the game. Oh man, the Lava Titan looks beast and can't help that It reminds me of Te KÄ from Moana, only that its hands/arms are in a liquid state and not hard molten, along with the fact it has a less human-like face then Te KÄ. You think that SDG confrontation with Ansem and Xemnas at the Old Mansion taking place earlier or during the middle of the game. Part of me thinks it's earlier as Sora is in his KH3 attire but I wouldn't be surprised if this scene takes place during the middle part of the game just like the Mickey and Maleficent scene at Disney Castle in Dream Drop Distance cause after Ansem and Xemnas left SDG were battling Neoshadows and Nobodies that was seen in the D23 Toy Story Trailer. Maybe they can't access Data Twilight Town at all. Now that it's all but confirmed Org. XIII have created Data versions of Disney worlds, I can see Ansem and Xemnas copying the info to create them from the old mansion and wiping the computer clean to limit Sora's options in bringing Roxas back. They just released HQ stills of the magazine images on KH official Twitter account,.